In June 2012 there was a Fish Kill on the River Vartry which is being investigated by the Fisheries and reported on the website of Wicklow County Council. The cause has not yet been determined. 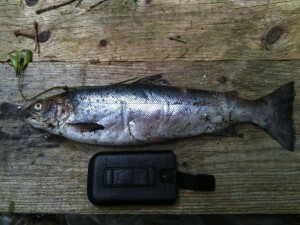 On Thursday the 28th we found a large 35 cm probably Sea Trout (or possibly Salmon) dead on the edge of the River. At first I thought that this was a positive sign since the fish seemed fully healthy and I presumed that death was caused by the flood the night before. While it is a positive sign to see such size fish in the river at this time, the negative issue of why and how such an event can happen is very upsetting. I hope that we can have news soon of just how this happened and how it can be prevented in the future as the Fisheries work hard to get to the bottom of this. Again “hats off” to the Fisheries for their diligence and continued support of the River Vartry which has taken it back from the brink to a good condition to host such fine fish. We can’t afford to loose them, but we hope that it is a preventable event that will not occur again and that we can recover from this.